SP4RX is a not-atypical hacker for hire. He lives in the sub-levels but regularly heads to the upper levels to break into corporate systems for the right price. On one of his jobs, he runs into another hacker named MEGA who manages to steal his stolen data away from him. This, to no surprise, causes SP4RX some problems. His brief association with MEGA is noted, and SP4RX is then targeted as the government tries to get to a so-called terrorist group named WRAITH that MEGA is a part of. This inadvertently forces SP4RX to join with them as they try to take down the government's ELPIS program that provides free cybernetic "enhancements" for people living on the lower levels. WRAITH is doing this because, under the guise of providing lower level inhabitants the means to work and earn a living, the ELPIS implants are also used to control people's actions, making them effectively slaves to the government's whims. The plot is a little complex for a sufficient summary (I've left out some bits in my notes above) but writer/artist Wren McDonald does an excellent job of explaining things throughout the story. Not only in establishing the dystopian future he's created, but also how the different classes view and act towards one another, and all the social mores that go with each. He uses some deceptively simple-looking art to convey some potentially complicated venues that, despite looking a little bright and flat at first glance, still manage to evoke the complexity of a Blade Runner era Los Angeles. Like any good science fiction story, the setting and plot are really a commentary on our current culture. The story reflects our concerns today. I don't think McDonald fears government-sponsored implants that act as mind control devices; that's obviously just a metaphor. But I read this as concern over technology being touted as an answer to our problems when, in fact, it's merely a more efficient way to control us. Think of the discussions that have come up regarding government back-door access to cell phones. Or the government's PRISM program (which is only known about at all thanks to Edward Snowden) that data mines Facebook, Apple, Google, Microsoft, and other major technology companies. There's obviously concern that providing misleading or even false information, and blocking dissenting commentary or discussion, will skew public perception and, therefore, acceptance. Interestingly, McDonald takes what strikes me as unusual take on dealing with this type of system. While SP4RX is himself leary of these programs at the start of the book, his approach is basically to live off-grid in the sub-levels. But ultimately, he winds up subverting the system by becoming a part of it. And it's not so much giving in to the overwhelming system but, rather, realizing that there's power in understanding how the system works. While McDonald, I think, is primarily focused on government-level actions, there's more than a little blame he throws toward corporations as well via their complicity. And I think that bears keeping an eye on as well. Dystopian stories can be depressing; they rarely show an outcome that will lead to a the dystopia becoming something other than exactly that, and the implication is that we're all doomed. And while McDonald doesn't exactly provide an uplifting ending either, it's certainly a lot more hopeful than a lot of other dystopian stories I've read. 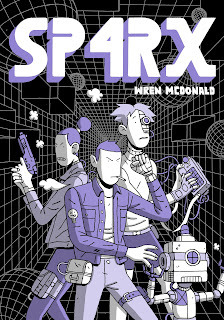 SP4RX is available now from Nobrow Press for $18.95.